Delaware PC Services, LLC Best computer, PC and MAC repairs in Delaware, located at 20660 Coastal Hwy Rehoboth Beach Delaware in the Sea Coast Center, Always FREE Evaluation No Appointment Necessary. Open 6 days a week. Virus and Spyware Removal only $79.99. Cement Paver stones painted with indoor / outdoor paint. 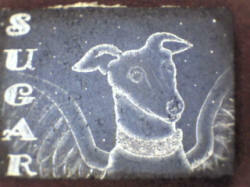 'In the Spirit' painting from your photo or a breed image, outlined in metallic silver paint. �2019 Delaware PC Services, LLC. All rights reserved.